Anyone who follows the home entertainment space closely probably agrees that TV is broken: archaic user interfaces, pricey bundles, six remotes that each do one thing, all limited to the confines of your home. Of course, realizing it's broken and knowing how to fix it are two different things. One attempt at a fix is Simple.TV. This $149 box (plus $59 a year for service) bridges the gap between the various devices you already own and the world of broadcast television. 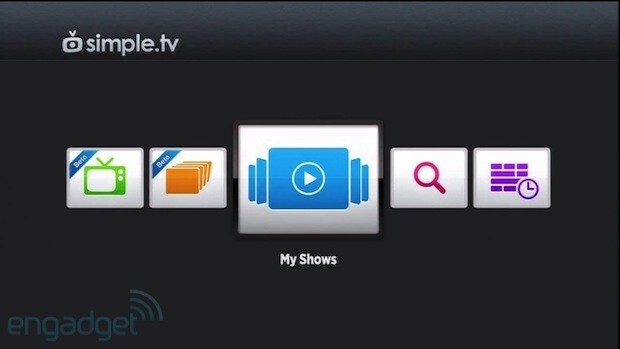 It allows you to access the plethora of content available via unencrypted digital cable, or for free via an antenna, on just about any device you own -- tablet, smartphone, PC or even a TV. Sounds pretty great, huh? But does it deliver? And can it replace your cable box and the high-priced service that goes with it? Just click on through, and you'll find out. 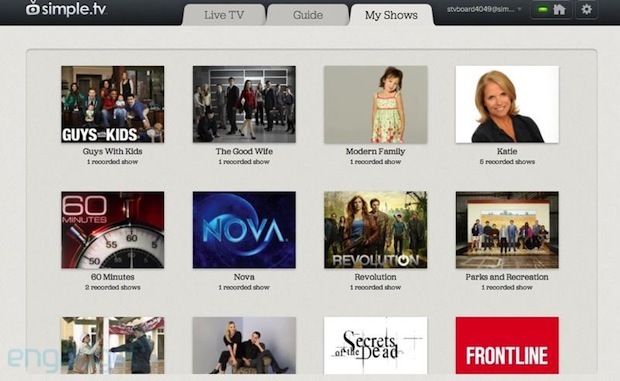 A nice solution if you've always wanted broadcast TV on your mobile devices, but that's about it. 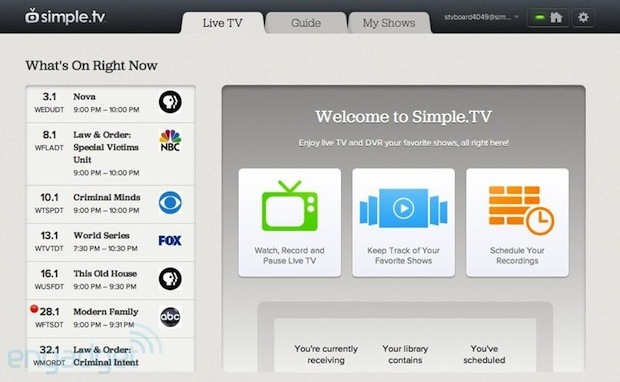 How would you rate the Simple.TV? Some things in life require a little additional explanation, and the Simple.TV is certainly one. The best way we can describe it is this: it's a networked TV tuner with optional storage for your mobile devices. In other words, it doesn't do anything by itself. A typical system will consist of the Simple.TV, an external hard drive, a tablet or PC, and a Roku connected to your TV. (Support for additional devices soon will come later, a Simple.TV rep said.) It's like a Slingbox but with fewer inputs and without the intelligence required to control a cable or satellite set-top box. But it is able to record. 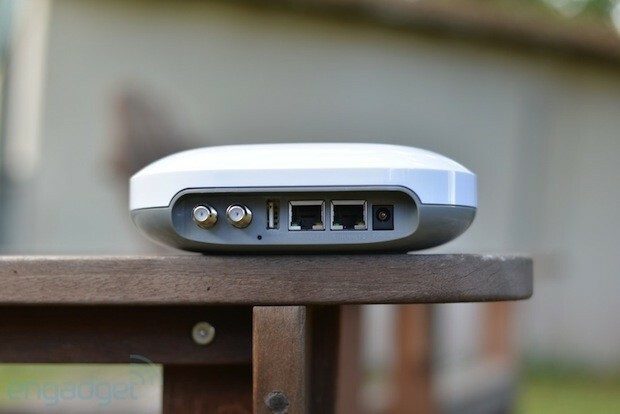 The Simple.TV is an oddly shaped, glossy white device that looks out of place in any home theater -- it reminds us of a wireless access point you'd see attached to the ceiling at work, except much lighter and with lower-quality plastic. The good news is that you probably won't put it in your home theater; rather, you'll likely connect it where your cable modem or internet enters your home. That's because the device requires a coax and network connection. The coax needs to be connected to your cable provider's feed or connected to an antenna. There are two coax and two network connections out back that pass through to make it easy to stack them. Lastly, there's a single USB port for attaching external hard drives (more than one requires a hub) to store your recordings -- there's no internal storage option. Inside, you'll find a single tuner capable of beaming live TV or recording one show, while allowing up to five devices to stream the same live show, or five different previously recorded programs. As you may have noticed, there's no video or audio output. That's because the Simple.TV depends on other devices to render the signals it tunes into. Another notable omission: WiFi. You shouldn't miss it, however, since this is a stationary box that can live anywhere in your home, as long as it has a wired network connection. There are two LEDs, one on the corner that lights up red, blue or violet depending on the state of the device (starting up, recording, etc. ), and a blue one up front to indicate power. Neither is distracting, which is a good thing as there's no way to adjust the brightness or disable them. When we say software, we really mean a web app and a Roku channel. When we say software, we really mean a web app and a Roku channel. There's no app for the iOS, or Android or the desktop -- we're told they are coming, though. You just point your browser to www.simple.tv and log in -- and no, there's not even a mobile browser-optimized version. If you subscribe to the premier service for $59 a year, or opt for a lifetime subscription, you can watch TV anywhere you have an internet connection. Without it, your five concurrent connections are limited to the confines of your home network. The experience is divided between three tabs; Live TV, Guide and My Shows. Live TV is the first one you see when you browse to the page with no way to set another default or bookmark your favorite. Live TV reveals a simple list of channels, showing what's on and if any shows are currently being recorded. From here, you select one to learn more about the program and gain quick access to watch it live, record that episode or record all the episodes that will air. The streaming experience is like that of most embedded web videos with the ability to watch full screen and skip forward or back, but no way to pop-out of the main browser window or quickly change the channel. We found it odd that while video is delivered via HTML5 on iOS devices, on the Mac or PC, Silverlight is the underlying technology -- newer computers handle it easily, but the 4-year-old computer we tried it on didn't fare as well. 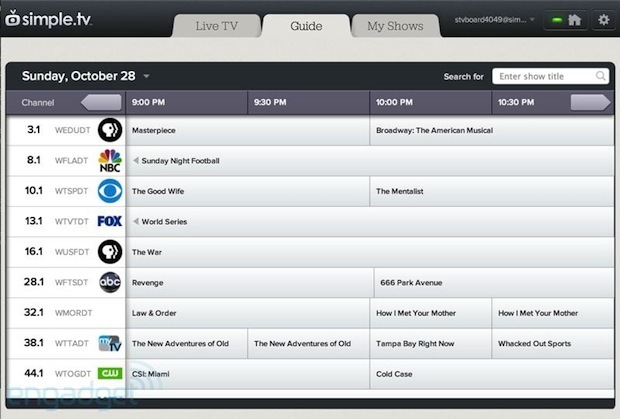 The Guide tab reveals the typical channel grid guide with a search box, which you'll use for scheduling recordings -- if you find something interesting airing live, you'll need to go back to the Live TV tab to watch it. Since you need to pay for the premier service to receive guide data, this tab isn't very useful if you don't. The essential recording indicators are all present to let you know what's already scheduled to record. There's a drop-down menu for easy access to select up to five days in advance, but no way to easily go to a specific day and time. Whether searching or browsing, the UI is much slower than we'd like, but the momentary delay as the screen updates is not to the point of being unusable. Once you select something, you're presented with additional details about the show, as well options to record a single episode or every episode in the series. The last tab up is My Shows, which shows your recordings in a tiled layout. Clicking on the art will show you which episodes are available to watch, and provides easy access to see what's coming up. From here, you can delete recordings one by one, or all at once and opt to cancel the series recording. The My Shows experience is much more responsive than the guide, and more modern-looking thanks to its show art. What's missing, though, is a list view or any sorting options whatsoever. In addition to the three main tabs, there are a few settings menus for things like deleting your series recordings -- no way to change their priority -- as well as seeing what's going to be recorded. Other options within the settings include the ability to check how much space on your external hard drive is available for further recordings, and the ability to have recordings start a minute earlier or even later. The only guide options available allow you to select which channels show up as well as initiate a channel scan -- this took about 20 minutes for an over-the-air scan. Finally, you can control which devices are connected to the Simple.TV, but right now this just lets you add or remove a Roku. Simple.TV's use of Roku is interesting as it is dependent on our favorite streamer to deliver video to an old-fashioned HDTV. If you just want to watch content on your mobile devices, you can skip the Roku. However, many still enjoy some viewing time in front of the big screen, so a Roku is an obligatory item for most Simple.TV setups. Accessing the Simple.TV is much like any other content on a Roku, you add the channel and then it shows up in your channel list -- right now, it's a private channel, so you have to log in to roku.com and add the URL manually. Once you launch the channel, you have almost the same level of functionality as you do on the web experience -- Live TV, Guide, My Shows, etc. The first problem we ran into with the Roku Simple.TV experience is that the Roku remote lacks the typical DVR buttons. Play, pause, etc. are there, but there's no Live TV, channel up/down or guide button. That was the least of our problems, however. The real problem is that the Simple.TV Roku channel user experience couldn't be any slower. The tuner requests failed as many times as they succeeded and most menus loaded far slower than almost any DVR we've ever used -- the first TiVo Premiere is up there, though. We can't imagine someone throwing out their DVR and relying on this for their primary TV viewing. All that being said, this is a beta version of the software, and there's little doubt updates are coming. But even if the user experience were snappy, there'd still be the quality problem. The video and audio output easily meets our expectations on mobile devices, but throw that same feed up on a 60-inch plasma with surround sound and you'll wish you didn't. To say the video is soft is an understatement: it almost looks SD. On top of that, the Dolby Digital sound that the content creator worked so hard to produce (and your local affiliate spent the bucks to deliver) gets down-mixed to stereo. In its current form, we'd be surprised if anyone found the Simple.TV Roku channel useful, but we can't imagine this won't be addressed in future updates. America's favorite pastime is certainly under attack from all angles, and while we suspect someone will eventually come along and flip the television industry on its head, we don't think Simple.TV is the device to do it. For starters, it's saddled with numerous hardware requirements, along with buggy software. But even when the software matures and proper tablet and phone apps are released, there's the matter of the subscription. That $59 a year essentially amounts to location services and guide data. Both of which competitors like Slingmedia offer for free -- though you could easily spend that and more on Slingplayer software. There are plenty of dynamic DNS services available for free, with sites like Schedules Direct offering guide data for $25 a year. Considering the 30-month break-even point and added resale value, we'd suggest the $299 lifetime option instead, though you'd have to really believe this startup will survive long-term. The limited offering really isn't an option considering a DVR isn't worth much without the ability to automatically schedule recordings. The value gets worse from there. Storage isn't included and since it can't record to network storage, you're going to have to buy an external drive just for it. Keeping the numbers round, once you buy a hard drive, a Roku and the service, we're talking about $500 for a single-tuner DVR that only works with basic cable or an antenna. That's still about $330 cheaper than a TiVo Premiere XL with lifetime service plus a TiVo Stream, but the TiVo can record four shows at once, works with various tablet and phone apps and supports premium cable. Another comparison worth making is the $199 Hauppauge Broadway. It relies on PSIP instead of offering real program guide data and you still have to supply your own drive to record to, but it has more inputs and the location services are free. In the end, once the bugs are worked out, the Simple.TV may fill a specific niche that most other companies are ignoring, but we give it almost zero chance of changing the way we watch TV.